May – 2013 – The Clutter Blog | You ARE Your CLUTTER. Celebrate it! Oh my goodness! Never would I have imagined that children I taught Whale Workshops to in the 1970’s or who contributed paintings to my Save the Whale book would find me decades later and write me lovely notes of appreciation. 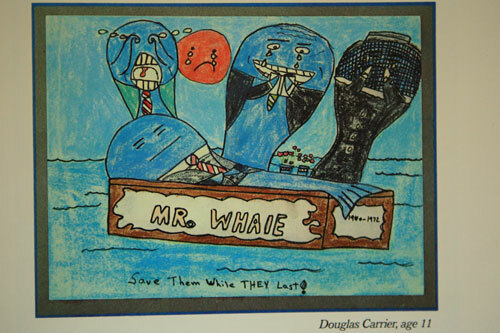 I am thrilled to have heard from Douglas Carrier who was 11 years old when he sent me an amazing painting of a whale funeral. I received his painting through the mail in 1974 and was stunned by his interpretation of the dying whales. I included his painting in my book: “There’s a Sound in the Sea – A Child’s-Eye View of the Whale” (Scrimshaw Press, San Francisco 1975). Scholastic Magazine published front page stories about the plight of whales and asked children to contribute to my book. Fifteen thousand children responded, and I chose about 96. Please see Douglas Carrier’s and my correspondence under “How Whales Pop Up”.